Here is the list of the hotels near Hyenville. Book your hotel near Hyenville today, Tuesday 14 May for the best price, reservation and cancellation free of charge thanks to our partner Booking.com, leader in on-line hotels reservation. Below here is the list the 50 closest hotels of Hyenville, sortable according your criteria. You will find the position of these accommodations on the Hyenville hotels map. Housed in an 18th-century building, Cottage de Claids is 2 km from the centre of Orval and 7 km from Regnéville-sur-Mer. It offers free Wi-Fi access and a shared living room with a TV and a fireplace. Both the room and the suite feature a wardrobe and a private bathroom with free toiletries and a hairdryer. A kitchen is available on site where guests can prepare their own breakfast. You can also relax in the hot tub in the garden. This property is 6 km from Coutances and 14 km from Coutainville Golf Course. Free private parking is available on site, and the Mont Saint Michel and D-Day Beaches are both 50 km away. Set in Orval in the Lower Normandy region, Gîte du Pois de Senteur features a terrace. This property offers access to free WiFi. This holiday home comes with a kitchen, a seating area, a dining area and a flat-screen TV. The holiday home also comes with 2 bathrooms with a bath and a shower. The holiday home offers a barbecue. A children's playground is available on site and hiking can be enjoyed within close proximity of Gîte du Pois de Senteur. Granville is 25 km from the accommodation. La Maison du Pois de Senteur is a traditional B&B located 4 km from Coutances. A continental breakfast is served daily and free Wi-Fi is provided. A flat-screen TV features in each of the traditionally decorated rooms. All of these rooms have a private bathroom that is fitted with a bath or a shower. At this property, breakfast is taken in the dining room beside the open fire. After breakfast, guests can relax on the terrace while children play in the play area. Free private parking is available and the B&B is 8 km from both Coutainville Golf Club and the beaches. Bars, restaurants and shops can be found 4 km away. Le Trapesin is a semi-detached holiday home situated in Orval-sur-Sienne in the Lower Normandy Region and is 42 km from Le Mont Saint Michel. The property is 47 km from Cancale and boasts views of the garden. There is a dining area and a kitchen equipped with dishwasher. A flat-screen TV with satellite channels is provided. Other facilities at Le Trapesin include a barbecue. Granville is 22 km from Le Trapesin, while Saint Helier Jersey is 49 km from the property. The nearest airport is Dinard Brittany Airport, 65 km from Le Trapesin. Three-Bedroom Holiday Home in Quettreville-sur-Sien. Three-Bedroom Holiday Home in Quettreville-sur-Sien. Is located in Quettreville-sur-Sienne. Complimentary WiFi is offered. This holiday home has 3 bedrooms, a living room and a fully equipped kitchen with a dishwasher and a microwave. A TV is available. Granville is 20 km from the holiday home, while Saint Lo is 38 km away. The nearest airport is Dinard Bretagne Airport, 111 km from the property. Located in Hérenguerville in the Lower Normandy region, Gite à la ferme entre Terre et Mer is a 3-star property featuring free WiFi. The accommodation is 23 km from Granville. The holiday home has 3 bedrooms, a flat-screen TV, an equipped kitchen with a dishwasher and an oven, and 1 bathroom with a shower. Saint Lo is 40 km from the holiday home, while Avranches is 44 km from the property. The nearest airport is Dinard Bretagne Airport, 114 km from the property. Ferienhaus Bricqueville-la-Blouette 100S is located in Bricqueville-la-Blouette. This property offers access to free WiFi. The holiday home includes 2 bedrooms and a kitchen with a dishwasher and a coffee machine. Granville is 30 km from the holiday home. La Verte Campagne - Hotel Restaurant is located in Trelly, in the heart of the Normandy countryside. It has an award-winning gourmet restaurant, and offers free on-site parking. This rustic farmhouse offers comfortable rooms and a lounge. WiFi is available in parts of the hotel. Breakfast is served daily, and a full English breakfast can be prepared upon request at the time of booking. The property’s restaurant serves seasonal dishes prepared with fresh, local products, and during summer, guests can enjoy afternoon tea in the hotels garden and terrace. 72 km south of Cherbourg, La Verte Campagne is close to the world heritage site of Le Mont St. Michel. The D-Day landing beaches are also a short drive from La Verte Campagne - Hotel Restaurant. Boasting accommodation with a terrace, Hausteil Regneville-sur-Mer 401S is located in Regnéville-sur-Mer. Guests may enjoy free WiFi. The holiday home includes 1 bedroom and a kitchen with an oven and a microwave. A TV is provided. Granville is 26 km from the holiday home. The nearest airport is Dinard Bretagne Airport, 117 km from the property. Holiday home L'Amelinerie is set in Hauteville-sur-Mer and offers water sports facilities. It provides free WiFi and barbecue facilities. The property includes a living room with a TV. A dishwasher, an oven and a microwave can be found in the kitchen. The holiday home offers a terrace. If you would like to discover the area, horse riding is possible in the surroundings. Granville is 25 km from Holiday home L'Amelinerie, while Saint Lo is 38 km from the property. The nearest airport is Dinard Bretagne Airport, 116 km from the property. Set in Saint-Denis-le-Vêtu in the Lower Normandy region, Gîte du petit fontenay features a garden. It has river views and free WiFi. Leading onto a terrace, the holiday home consists of a fully equipped kitchen and a flat-screen TV. The holiday home offers a barbecue. Guests can also relax in the shared lounge area. Granville is 30 km from Gîte du petit fontenay. Dinard Bretagne Airport is 117 km from the property. Guest accommodation Hauteville-sur-Mer Preferred hotel ! Set in Hauteville-sur-Mer, La Maison Bleue features accommodation with a terrace and free WiFi. Guests staying at this holiday home have access to a fully equipped kitchen. Comprising of 2 bedrooms, this holiday home features 1 bathroom with a bath, a shower and free toiletries. A flat-screen TV and a DVD player are available. Around the clock assistance is available at the reception, where staff speak German, English and Spanish. The holiday home offers a barbecue. There is a garden at this property and guests can go cycling and fishing nearby. Granville is 19 km from La Maison Bleue, while Saint Lo is 41 km away. The nearest airport is Dinard Bretagne Airport, 110 km from the accommodation. Gîte Mer et Soleil is 2 km from the centre of Hauteville-sur-Mer and a 3-minute drive from the beach. It offers free Wi-Fi, a furnished terrace and a living room with a TV, a DVD player and a fireplace. The house is set over 2 levels and includes 3 bedrooms with a wardrobe. The bedroom on the ground floor has its own private bathroom and it is accessible for guests with reduced mobility. Barbecue facilities are provided at Gîte Mer et Soleil. The colourful kitchen is equipped with a stove, an oven and a fridge. A microwave and an electric kettle are also provided. This property is 11 km from Bréhal Golf Course and 18 km from Granville and its aquarium. Free private parking is available on site. Situated in Coutances, Domaine de la Boudière features accommodation with free WiFi and flat-screen TV. There is a fully equipped private bathroom with shower and free toiletries. Guests at the bed and breakfast can enjoy a continental breakfast. Granville is 30 km from Domaine de la Boudière, while Saint Lo is 30 km away. Hotel Coutances Preferred hotel ! Hotel The Originals Coutances Cositel (ex Inter-Hotel) offers free WiFi, a friendly welcome and free parking. It is located in the heart of the Cherbourg Peninsula, a 15-minute drive from the Normandy coast and beach. Guest rooms at the Hotel The Originals Coutances Cositel are equipped with en suite facilities, a TV and telephone. Buffet breakfast is available daily. Hotel The Originals Coutances Cositel is situated near Coutances. The town’s 1000-year-old gothic Cathedral of Notre-Dame is worth a visit. The Normandy landing beaches are also just a 45-minute drive away. Le loup dans la bergerie is located in Montmartin-sur-Mer. Featuring free WiFi, the property also has free bikes and barbecue facilities. The bed and breakfast comes with a satellite flat-screen TV. There is a seating area and a kitchen complete with an oven and a microwave. A buffet breakfast is served daily at the property. Cycling and hiking can be enjoyed nearby. Granville is 23 km from the bed and breakfast. Dinard Bretagne Airport is 114 km away. Ferienhaus Regneville sur Mer 300S is set in Regnéville-sur-Mer. Guests are welcome to enjoy the free WiFi. This holiday home is fitted with 2 bedrooms, a TV, and a kitchen. Granville is 25 km from the holiday home, while Saint Lo is 38 km away. The nearest airport is Dinard Bretagne Airport, 115 km from Ferienhaus Regneville sur Mer 300S. Au Coeur Des Pres Sales is located in Montmartin-sur-Mer, 40 km from Le Mont Saint Michel and 42 km from Cancale. Free private parking is available on site. The room has a flat-screen TV and include a seating area for your convenience. For your comfort, you will find free toiletries and a hairdryer. Au Coeur Des Pres Sales features free WiFi . The bed and breakfast also offers free use of bicycles. Granville is 18 km from Au Coeur Des Pres Sales, while Saint Helier Jersey is 45 km away. The nearest airport is Dinard Brittany Airport, 59 km from Au Coeur Des Pres Sales. Guest accommodation Montmartin-sur-Mer Preferred hotel ! Situated in Montmartin-sur-Mer in the Lower Normandy region, Le marais features a terrace. This holiday home offers accommodation with free WiFi. The holiday home is composed of 2 bedrooms, a dining area, a fully equipped kitchen, and 1 bathroom. Granville is 23 km from the holiday home, while Saint Lo is 40 km from the property. The nearest airport is Dinard Bretagne Airport, 114 km from the property. Situated in the centre of Coutances, Hôtel La Pocatière welcomes you near the cathedral and the main shopping area. It features comfortable, individually decorated rooms with free Wi-Fi internet access. Hôtel La Pocatière makes an excellent base for discovering Normandy. Guests benefit from free parking and famous sites including the D-Day landing beaches are only a one hour-drive away. A dinner, bed and breakfast option is available in the hotel. The friendly and attentive staff at the Hôtel La Pocatière will be happy to help you organise your stay in Coutances 24 hours a day. Set in Montmartin-sur-Mer, Le Marais Chambre B&B provides accommodation with free WiFi and seating area. There is a fully equipped private bathroom with shower and a hair dryer. Guests at the bed and breakfast can enjoy a continental breakfast. Le Marais Chambre B&B offers a barbecue. A terrace can be found at the property, along with a garden. Granville is 23 km from the accommodation, while Saint Lo is 40 km away. The nearest airport is Dinard Bretagne Airport, 114 km from Le Marais Chambre B&B. Featuring accommodation with a terrace, Cosy studio Le Marais is located in Montmartin-sur-Mer. This apartment features free WiFi, a tennis court, as well as barbecue facilities. The apartment includes a kitchen with an oven and a microwave, as well as a coffee machine. Guests at this property can enjoy cycling nearby, or make the most of the garden. Granville is 23 km from the apartment, while Saint Lo is 40 km from the property. The nearest airport is Dinard Bretagne Airport, 114 km from the property. Maison Individuelle is located in Lingreville and offers a garden, a terrace and a shared lounge. The property was built in 1970 and features accommodation with a balcony. Cycling can be enjoyed nearby. Granville is 17 km from the homestay, while Saint Lo is 44 km away. Dinard Bretagne Airport is 108 km from the property. Bed and Breakfast Le Mesnil-Aubert Preferred hotel ! Situated in Le Mesnil-Aubert, Chambres d'hôtes Au Hameau features accommodation with free WiFi and a garden. The bed and breakfast offers a seating area with a flat-screen TV and a private bathroom with a hair dryer and bath. There is also a microwave, fridge and a kettle. A continental breakfast is served daily at the property. If you would like to discover the area, snorkelling is possible in the surroundings. Granville is 20 km from Chambres d'hôtes Au Hameau, while Saint Lo is 38 km away. The nearest airport is Dinard Bretagne Airport, 113 km from the accommodation. Ferienhaus Hauteville-sur-Mer-Plage 402S is located in Hauteville-sur-Mer. Guests may enjoy free WiFi. The 3-bedroom holiday home is equipped with a kitchen with a dishwasher, and a bathroom with a shower and a washing machine. Saint Malo is 50 km from the holiday home, while Le Mont Saint Michel is 37 km from the property. Dinard Bretagne Airport is 57 km away. Situated in Hauteville-sur-Mer in the Lower Normandy region, Two-Bedroom Apartment Hauteville-Sur-Mer with Sea view 01 is a 3-star property featuring free WiFi. Guests staying at this apartment have access to a fully equipped kitchen. The apartment features a TV and 2 bedrooms. Granville is 22 km from the apartment. The nearest airport is Dinard Bretagne Airport, 113 km from the property. Set in Hauteville-sur-Mer in the Lower Normandy region, Apartment Hauteville Sur Mer IJ-1137 is a 3-star property featuring free WiFi. Guests staying at this apartment have access to a fully equipped kitchenette. The apartment includes 2 bedrooms and a living room with a TV. Granville is 22 km from the apartment, while Saint Lo is 42 km away. The nearest airport is Dinard Bretagne Airport, 113 km from the property. Set in Hauteville-sur-Mer in the Lower Normandy region, Holiday home Maison de vacances - HAUTEVILLE-SUR-MER features a garden. This holiday home provides barbecue facilities. The holiday home is fitted with a TV. The kitchen features a dishwasher. Granville is 22 km from the holiday home, while Saint Lo is 42 km from the property. Dinard Bretagne Airport is 113 km away. Featuring accommodation with a terrace, Gris Bleu is set in Lingreville. Housed in a building dating from 1900, the holiday home is in an area where guests can engage in activities such as fishing and hiking. This holiday home features 3 bedrooms, a living room and a fully equipped kitchen. A flat-screen TV and DVD player are featured. The holiday home offers a barbecue. Granville is 16 km from Gris Bleu. The nearest airport is Dinard Bretagne Airport, 107 km from the property. Ferienhaus Hauteville-sur-Mer-Plage 200S is located in Hauteville-sur-Mer. Complimentary WiFi is available. The holiday home includes 3 bedrooms and a kitchen with a dishwasher and an oven. A TV is featured. Granville is 21 km from the holiday home. Dinard Bretagne Airport is 111 km from the property. Ferienhaus Hauteville-sur-Mer-Plage 401S is located in Hauteville-sur-Mer. Free WiFi is featured. The holiday home includes 4 bedrooms, a kitchen with a dishwasher and an oven, as well as a coffee machine. Granville is 21 km from the holiday home, while Saint Lo is 43 km from the property. The nearest airport is Dinard Bretagne Airport, 112 km from Ferienhaus Hauteville-sur-Mer-Plage 401S. Holiday home St Denis Le Vetu K-809 is situated in Roncey. The accommodation is 31 km from Granville. The property includes a living room with a TV. A dishwasher and a microwave can be found in the kitchen. Saint Lo is 30 km from the holiday home, while Avranches is 49 km away. Dinard Bretagne Airport is 118 km from the property. The ibis Budget Coutances is located a 5-minute drive from the train station and town centre, where you can visit the 18th-Century Gothic cathedral. Agon-Coutainville Beah is a 15-minute drive away and Cherbourg, Mont Saint-Michel and the D-Day Landing Beaches are all over an hour's drive from the property. Each air-conditioned room has a private bathroom, TV, free fiber optic WiFi and is serviced by a lift. A buffet breakfast is served every morning in the dining room. A vending machine dispensing snacks and another one dispensing beverages are available in the lobby. A microwave is available for guests to use and is located opposite the lift. Guests can relax on the outdoor terrace and the staff are available to assist 24 hours a day. Free private parking is provided. Set in Agon Coutainville, Gites de la Pointe d'Agon features accommodation with a terrace and free WiFi. The accommodation is 34 km from Granville. The property includes a living room with a flat-screen TV. Featuring garden views, this holiday home also offers a well-equipped kitchen with a dishwasher, an oven and a microwave, as well as 2 bathrooms with a bath and a hair dryer. The holiday home offers a barbecue. A children's playground is also available at the property, while guests can also relax in the garden. Saint Lo is 41 km from Gites de la Pointe d'Agon. Le Clos Des Tilleuls is a bed and breakfast located a 10-minute drive from the sea. Its well-being centre has a hot tub, sauna and fitness room, and free Wi-Fi access is available in public areas of the property. Each room is equipped with tea and coffee making facilities and a TV. The private bathrooms feature a multi-sensory shower and a hairdryer. Free private parking is possible on site. 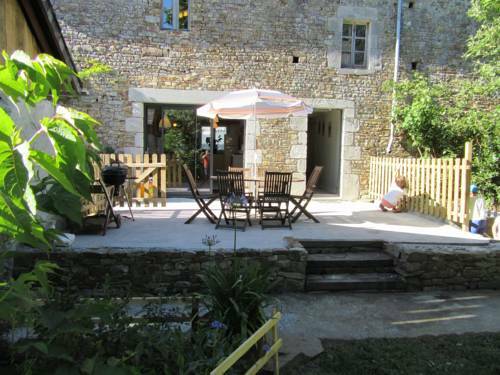 Located in Roncey, Le Douitel offers accommodation with free WiFi and a garden. A continental breakfast can be enjoyed at the property. Granville is 34 km from the bed and breakfast. Dinard Bretagne Airport is 113 km away. Located in Lengronne, Ferienhaus Lengronne 400S offers a private pool. This property offers access to free WiFi. The holiday home includes 4 bedrooms and a kitchen with a dishwasher and an oven. A TV is offered. Granville is 21 km from the holiday home, while Saint Lo is 33 km away. The nearest airport is Dinard Bretagne Airport, 109 km from Ferienhaus Lengronne 400S. Maison De Vacances - Brainville 1 is located in Brainville and offers barbecue facilities and a garden. This holiday home features a terrace. The holiday home comes with 2 bedrooms, a TV and a fully equipped kitchen that provides guests with a dishwasher, an oven, and a washing machine. The holiday home offers a children's playground. Granville is 35 km from Maison De Vacances - Brainville 1, while Saint Lo is 34 km away. Maison De Vacances - Brainville 2 is situated in Brainville. Guests staying at this holiday home have access to a terrace. The holiday home features 2 bedrooms and a fully fitted kitchen with an oven and a microwave. A TV and DVD player are featured. The holiday home offers a barbecue. A children's playground is also available for guests at Maison De Vacances - Brainville 2. Granville is 35 km from the accommodation. Gite Jouvin offers pet-friendly accommodation in Cerences. Saint Malo is 95 km from the property. Free private parking is available on site. The accommodation features a TV. Some units include a dining area and/or patio. There is also a kitchen, fitted with an oven and microwave. A toaster and refrigerator are also available, as well as a coffee machine and a kettle. Gite Jouvin features free WiFi . Gite Jouvin also includes a barbecue. Le Mont Saint Michel is 55 km from Gite Jouvin and the D-Day landing beaches are 80 km away. The nearest airport is Pleurtuit Airport, 100 km from Gite Jouvin. Offering free WiFi and garden views, Le Petit Clos is an accommodation set in Agon Coutainville. Guests staying at this holiday home have access to a fully equipped kitchen and a terrace. The holiday home includes 2 bedrooms and a living room with a TV. Granville is 32 km from the holiday home, while Saint Lo is 39 km away. Offering free WiFi and garden views, La maison verte is an accommodation situated in Agon Coutainville. Guests staying at this holiday home have access to a fully equipped kitchen and a terrace. This holiday home features a balcony, a living room and a TV with DVD player. Granville is 32 km from the holiday home, while Saint Lo is 39 km away. Ferienhaus Agon Coutainville 401S is set in Agon Coutainville. The accommodation is 32 km from Granville. The holiday home is fitted with 2 bedrooms and a fully fitted kitchen with an oven. Saint Lo is 39 km from the holiday home. Set in Agon Coutainville, L'estran provides accommodation with a terrace and free WiFi. The accommodation is 34 km from Granville. The holiday home is composed of 3 separate bedrooms, a fully equipped kitchen, and 1 bathroom. A TV is offered. Saint Lo is 41 km from the holiday home. With a private terrace, Hotel La Villa Julia is located in the centre of Agon-Coutainville, 800 metres from the casino and the horse track. The hotel is located just 100 metres from the beach. Guest rooms are bright and have a modern décor. They are each equipped with a flat-screen TV and an en suite bathroom. A continental breakfast is served each morning and can be enjoyed in guests’ rooms. Guests can also sample a drink and tapas at the lounge bar on site. Coutainville Golf Course is only 1 km away, Granville is 30 km away and the famous Omaha Beach is 50 km from the hotel. Free Wi-Fi access is available throughout and free public parking is possible on site. Set in Agon Coutainville, Maison De Vacances - Agon-Coutainville 2 offers a tennis court, a garden and a barbecue. Guests staying at this holiday home have access to free WiFi. The holiday home has 3 bedrooms, a TV and a fully equipped kitchen that provides guests with a dishwasher, an oven, a washing machine and a microwave. Granville is 33 km from the holiday home. Located in Agon Coutainville in the Lower Normandy region, conciergerie-gussy features a garden. The property has garden views. The holiday home features 3 bedrooms, a flat-screen TV with cable channels and a fully equipped kitchen that provides guests with a dishwasher and an oven. The holiday home offers a barbecue. A bicycle rental service is available at this property. Granville is 34 km from conciergerie-gussy, while Saint Lo is 41 km from the property. Four-Bedroom Holiday Home in Monthuchon is set in Monthuchon. Complimentary WiFi is provided. The holiday home includes 4 bedrooms, a kitchenette with a dishwasher and a microwave, as well as a coffee machine. A TV is available. Granville is 35 km from the holiday home. Situated in Agon Coutainville in the Lower Normandy region, the holiday home has a garden. Providing free WiFi, the property also has free bikes and a casino. The holiday home is composed of a fully equipped kitchen, and 1 bathroom. A flat-screen TV is available. Agon Coutainville offers a barbecue. A terrace is available on site and cycling can be enjoyed within close proximity of the accommodation. Granville is 33 km from Agon Coutainville. Below here is the hotels map of Hyenville. Names and details of Hyenville hotels can be shown on the map clicking on the prices icons.